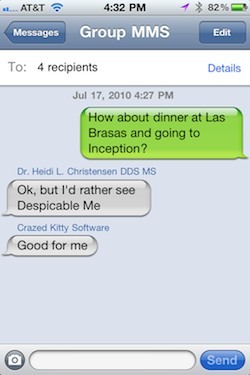 You don’t need to download any apps to send group text messages with your iPhone. Hidden away in iOS 4 is the ability to send group text messages, now this may not seem that exciting by default but here’s why it’s great: using group messaging, you can send 100 people a text message but it only counts as ONE sent text! If recipients also enable group messaging, then everyone can have a massive group chat together at the expense of only one text message sent, regardless of the amount of users! I came across this awesome tip (and the screenshot) on ZDNet’s The Apple Core blog, where it was independently verified with AT&T that sending group texts like this only counts as one sent message. If you don’t have an unlimited texting plan, this is without a doubt the cheapest way to send a massive amount of texts between you and your friends. Note that this group messaging feature may only be available to AT&T customers. Oh and by the way, this is for TEXTING, as in SMS – if you do group texting with imessage it does not incur the SMS fees because it uses the Apple iMessage service instead. I’ve iphone 3g and ios 4.1, but I’ve not Settings -> Messages -> Group Messaging. not even available in iphone 4. He is talking rubbish. Oops… Looks like you’re talking rubbish. the option is very much there on Iphone 3g IOS 4x. Got me in trouble several times before I found out how to turn it off lol. I guess it’s available only in North America. I have it on my iPhone 4. Perhaps the author of the article should have clarified this point. I’m in Canada with an iPhone 4 running iOS 4.1 and i don’t have this option either. I would love it! It’s on my 3G running OS 4.1 too. Does Apple set regional differences to featuresets? Maybe this is AT&T only? I just enabled it on my iPhone 4. But I was always able to select more than one person to whom to address a new SMS, even before this. What has this done that is different? The MMS group message method sends out the group address list along with the message. Each person who receives a group MMS message and has this feature turned on will see all of the people on the text list and their reply will go to everyone on the list – for the price of a single message. The way you have done group messaging before sends out an individual text message to each person and they do not see the list. Each recipient can only reply to the originator, a group reply would require them to add all the other names. And this is carrier dependent, Apple does display or hide the feature based on carrier profiles. I’m in Africa and using iPhone 4 but this option is not available on my settings also, please can some1 help its really annoying. I have an iphone 3g with ios4 but group messaging isnt on my settngs… And i also hav tmobile.. Can someone help? my phone is having the same problem and im t-mobile also. Im in Ohio, it works!! He already said may only be on AT&T phones!! Ok, got my new iPhone 4. I really need to send a group text to give them info on the meeting. Now I need to make a group in my contacts. Wait, where is that option. (10 min later) Hmmm…Can’t find it. Guess it’s just cause I’m not used to the phone yet. (look on google). What? I have to create it on my computer and then sync it to my phone? Weird but OK. (10 min later) There got all my contacts into a group. Alright, now time to send a text to them all. Ummm….where is that option? (I keep looking) (10 min later) Weird, I can’t find it. I must be retarded or something. (Look on google again, 10 min later). WHAT? I can’t send a group text with one button? WTF! What is the point in creating a group when I have to select all the contacts individually? *$#@% YOU APPLE (throw iPhone across the room). I want my EVO back! If you enable group messaging you can only send to 10 people in total. If you want to send a text to more then 10 people then you must disable group messaging or it will fail. iPhone and AT&T doesn’t allow more than 10 people to be group texted. And u have to use a third party app to be able to click a “group” and text. Otherwise you have to add all 10 contacts manually. U will notice once you add the 10th contact the little blue + button disappears. I have not found a way by app to send more if you do the text fails. Or only 10 people get it out of the let’s say 15 you put in list. If anybody has a way please post! I agree. After “everyone” telling me I needed to upgrade from Blackberry to iPhone, I was very disappointed not to be able to send a group text message as easily (without an app) as I could with my Blackberry! Who is the dumbass that wanted to see Despicable Me instead of Inception? My iPhone 4 won’t even do ten in a group. My iPhone 3 was able to send 150 loaded manually but my 4 stops at 6. Go figure. Any ” clear ” ideas on how to increase number of recipients? Why can’t this be done with MMS messages??? Hi! I’m using iphone 4s with ios 9.2 how can I do it. It does not appear in my settings. Thanks I badly need that.